Anxiety is often a stronger response then needed to a normally stressful situation. How one manages stress and anxiety can make or break a meeting or sale or date. Dr. Diego can help you cultivate the skills need to manage crucial situations. Most performance refinements can be addressed in a few sessions that don’t involve an in depth exploration of your childhood. Sessions focus on the situation and experiences you wish to change and address any fear, apprehension, or anxiety you may experience. Proper attention to experiences and skill building is at the heart of crafting your own solutions today and in days to come. It’s more than coaching, its working together to define what is biologically and neurology going on and following through on a plan of action. Fear can be a powerful motivator. Unfortunately for the most part it motivates us to avoid or withdraw. Most fears can be addressed with CBT and ART. The more specific the fear, the more specific we can focus in session in fewer sessions, like a fear of flying. Fear of flying addressed using ART in Tampa Tribuine. 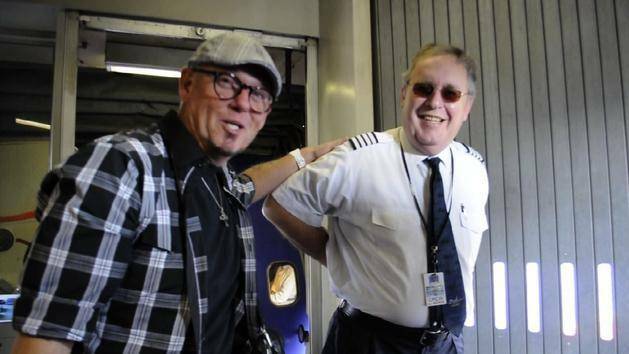 Cledus T. Judd also got past his fear of flying after the therapy normally used to treat PTSD. Back in the late 1990s, country music comedian and radio personality Cledus T. Judd was returning to Orlando from a tour with Kenny Chesney when his flight hit such extreme turbulence that he was thrown out of his seat and he broke his nose, leaving him a bloody mess. Judd, a morning personality on Tampa’s WQYK (99.5 FM), thought the plane was going to crash. He was so traumatized he has flown only once in all the years since. That has meant hundreds of thousands of miles driving to shows in the years since. He says he also has lost hundreds of thousands of dollars because of others he can’t get to. “It got so bad that my best friend, a Delta pilot, could make it to Munich before I could make it from my home in Clearwater to see my daughter in Cartersville, Georgia,” said Judd, whose real name is Barry Poole. But a chance meeting with a stranger on a golf course a few weeks ago seems to have led to a cure for Judd’s fear of flying. And that may be an unlikely boost for a promising new therapy for post-traumatic stress disorder being studied by the University of South Florida. Sullivan said he listened to Judd, saw the look on his face, and had a suggestion. The restaurateur is working with the USF College of Nursing’s military liaison, Carrie Elk, on finding additional funding for a treatment she and principal investigator Kevin Kip are studying called Accelerated Resolution Therapy. The therapy, which uses eye movements to help patients replace traumatic memories with more pleasant ones, has already shown positive results in a study the researchers have conducted on civilians. “I told Cledus I know this woman who has this program, and it has worked,” Sullivan said. Judd, 47, said he was deeply moved by the suggestion. So Judd contacted Elk, who treated him in her private practice about a week ago. At first, the comedian, whose country music parodies make him the Weird Al Yankovic of the Grand Ole Opry set, said he felt “a little guilty” about seeking out a treatment being studied for treatment on combat traumas. But he said he wanted to fly so bad that he overcame his guilt. Elk said it doesn’t matter whether someone has experienced trauma from battle, a bad flight or an abusive spouse. The results of the USF study on civilians, which was funded by the Substance Abuse and Mental Health Services Administration and wrapped up last month, “were pretty amazing,” Elk said. The civilian study found that those undergoing the therapy were no longer experiencing PTSD symptoms, had increased levels of sleep quality and quantity and decreased levels of depression. Those results, she said, will be presented to an upcoming American Psychological Association conference and are under review for publication in the Journal of Traumatic Stress. Elk and Kip are conducting another study, funded by the Department of Defense, aimed at veterans. So far, the researchers have treated 40 of the 80 veterans they have funding for and are looking to enroll the rest by August. Judd said he attended two sessions with Elk. Judd – who spent years driving by Tampa International Airport and had even booked himself onto flights, only to opt to drive – finally got back on a plane Wednesday. The pilot announced the flight would be bumpy. So well that Thursday, he flew back to Tampa. Judd said he was so elated by the experience that he videotaped his journey with an eye toward documenting how fear can be overcome. He got to meet the pilot afterward and gushed about the whole thing on his radio show. Sullivan said he hopes Judd’s experience will help increase awareness of the treatment and funding for trials so the USF researchers can eventually add to their current veteran study and someday treat active-duty troops. Elk said that while she is heartened to hear her patient was able to fly again, more study is needed.